Adam’s and Stovall’s Brigade reorient themselves facing south and advance toward Kelly Field. 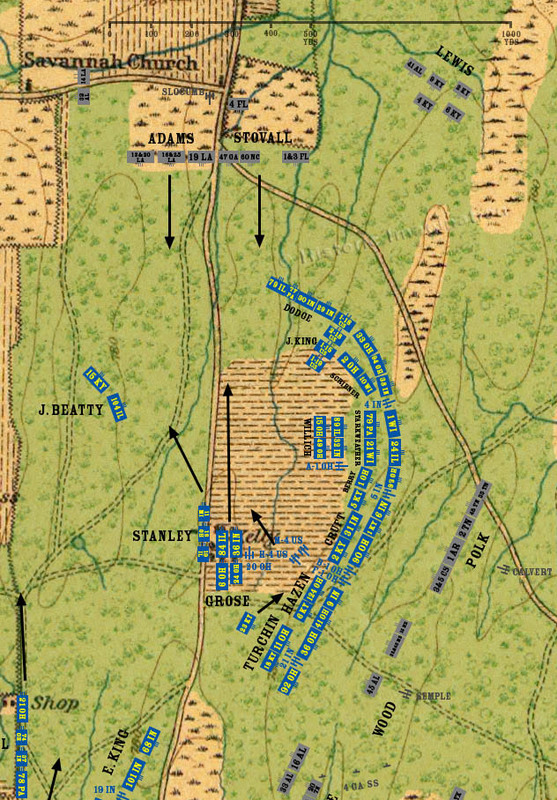 Adams leaves the 32nd Alabama and the 14th Louisiana Sharpshooter Battalion behind to protect his right flank. In Stovall’s Brigade, the 4th Florida falls behind. Slocumb’s Battery unlimbers on high ground near the Lafayette Road and begins shelling Union forces moving in Kelly Field. In response to the Confederate presence to the north, Grose’s brigade of Palmer’s division, minus the 23rd Kentucky left with Hazen’s brigade, moves north. Stanley’s brigade moves into the woods west of the field to set up a defensive position.